Nah....... it'll always be 28R!! Which may suggest the drone was sighted west of the airport! Previous drone sightings at LHR (from the air, so classed as airproxes) have involved inbounds on 09L, so in the same area as the 27R departure flightpath. In a demonstration that nothing is really new, here's a post by Capot from 2016 in R&N, on the subject of drones. I well remember the fury of most posters back in 2014 when Capot suggested that drones were a threat. I've been in the air transport industry since 1969, in a number of different sectors, eg airline management, airport management and engineering, working in a number of different countries, eg UK, UAE, Oman, Jordan, USA, Israel (Gaza), Tunisia, Algeria, Greece and the Philippines. Before that I was in the military for 10 years, including the final 3 years working as an Intelligence officer in the Gulf region. At various times, and in various ways, I have been closely involved in anti-terrorist action and aviation security. In my view, the free availability of the sophisticated drones that are around now, as well as of the more and more sophisticated ones that are coming fast down the line, represents the biggest threat to air transport (to say nothing of humanity as a whole) that has been seen so far, not excluding hijacking by suicidal maniacs, SAM firings by rogue military forces, or Muslim and other religious extremists. The threat comes from unintentional collisions, or from terrorist attacks for which drones can be used in several ways. The threat cannot be diminished by laws governing their operation, for the obvious reason that laws are obeyed only by the good. The ONLY way that the threat can be reduced to as low as reasonably practical is to impose the same controls on their manufacture and distribution that apply to dangerous, ie nuclear, weapons, with very long prison sentences for breaking the law. And this needs to be done sooner rather than later. Any drone is a threat to safety, or a dangerous weapon if the user wants it to be, and they are out there, now, in the hands of idiots and terrorists.Unquote. The funny thing was that at that time I, and the few PPRuNe experts who agreed with that post, were roundly monstered by the R&N majority who saw little harm in drones, live and let live, no real danger from these little toys, got one myself, etc etc. It will be interesting if any definitive proof of this 'sighting' ever shows up..... rather than the Social Media self-fulfilling dronefest-frenzy at LGW. If they had carried on with departures and an aircraft had hit it, would that have constituted sufficient "proof" ? Is it the same party(ies) as LGW or is it a copy cat. Either way our PC plods need to sort it out in double quick time. They have...there are currently start up delays of up to an hour, plus or minus, as the backlog clears but that’s better than it was looking a couple of hours ago. Well LHR might get the chance to use the technology, flights suspended due to 'drone sighting'. 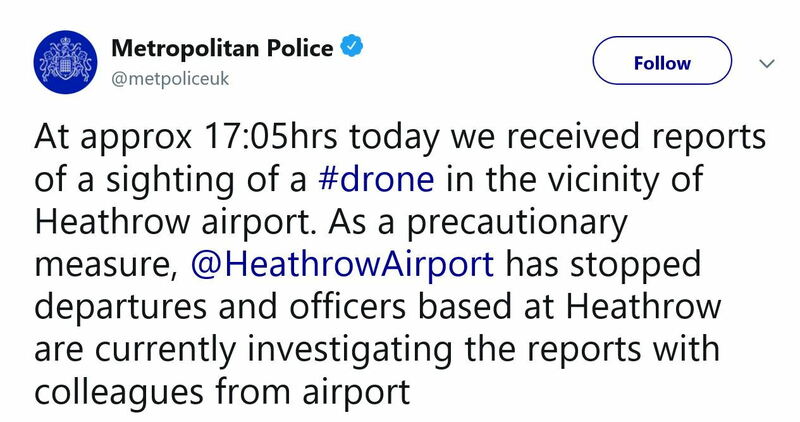 Drone induced shutdown of Gatwick & Heathrow. Peter Gibson of CASA being interviewed on radio stated ' if a pilot is notified that a drone is visible or operating in the vicinity of the airport approach, the pilot can choose an alternate approach', really, opposing traffic, tail winds, etc, come to mind. Running out of gas also comes to mind. Some aircraft have radios to call ATC and ask for another runway and to coordinate with other traffic. Some pilots carry reserve fuel for that. Interestingly, the aforementioned Peter Gibson, in a recent interview (presumably not the one referred to above) stated that about 80% of drones have control systems that embed the drone serial number in the signal transmissions and that this, in conjunction with compulsory drone registration in Australia, would dramatically change the way rules relating to drones are enforced there. Yes, it was in that interview that the embedded serial no was mentioned. Haven't seen the interview yet, but I assume that the people set on causing intentional disruption would likely fly the 20% of drones without serial numbers. I'm no drone pilot, but from what I understand the radio tech is straightforward to switch out. So even if drones are officially registered and all manufactured drones to market are traceable, it wouldn't be difficult to circumvent. This drone issue will take a combination of legislation, education, technology and contingency planning to resolve.